Here you will find archived news articles on past events relating to the 1st Buckie Boys’ Brigade. 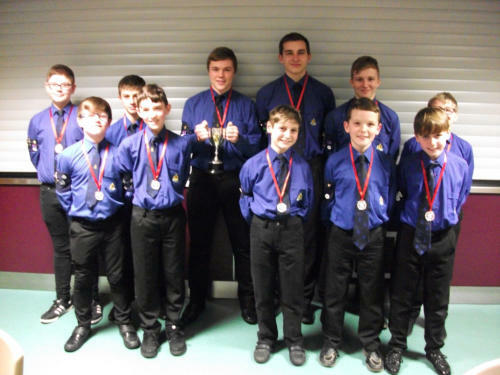 21.03.2016 - Top of The Form Team Place Third Congratulations to 1st Buckie team who finished third in Banffshire Battalion top of the form tournament. 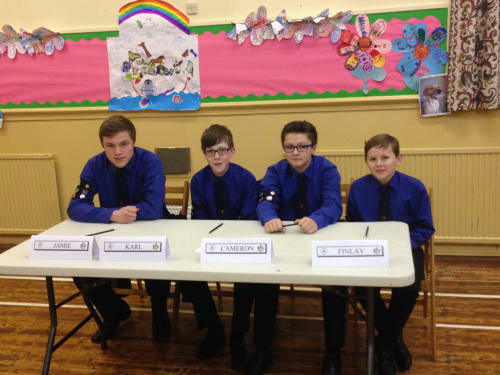 Left to right : Jamie Wood, Karl Thomsen, Cameron Grant & Finlay Mckay. 21.02.2016 - Senior 5 Aside Finish Fourth Congratulations to our senior 5 Aside football team who finished 4th overall in at the scottish finals in Dundee on Saturday 21st February 2016. Pictured below : Innes McKay, Ryan Brindle, Greg Hay, Jamie Wood and Brodie Christie Lee Cowie, Evan Smith, Scott Innes and Ross Coull. 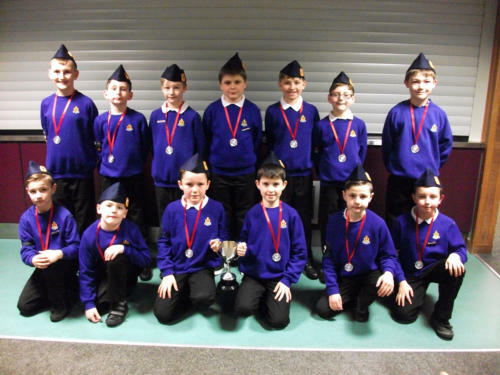 03.02.2016 - Swimming Gala Success & News Update Congratulations to 1 st Buckie, winning both the Swimming trophies. 1 st Banff will play at Greenock on the 5 th March in the Scottish Junior 5 Aside Final 1 st Buckie will play at Grangemouth on the 20 th February in the Senior 5 Aside Football final The Building Your Skills Course will now be held on Sunday 28 th February at Banff – info to follow. Reminder that the Company Top of the Form will be held in Turriff on Wednesday 24 th February, 7pm. Battalion Executive Meeting in Turriff on Wednesday 24 th F#ebruary. 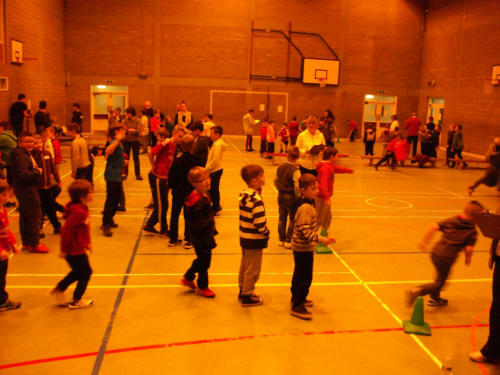 30.01.2016 - Anchor Boy / Junior Fun Day Great day yesterday at the Anchor/Junior Fun Day at Buckie Community High School. Over 130 boys enjoyed the afternoon. Boys attending received their Fun Day badge. Many thanks to all the helpers. Next event! Battalion Swimming in Buckie on Wednesday 3 rd February! 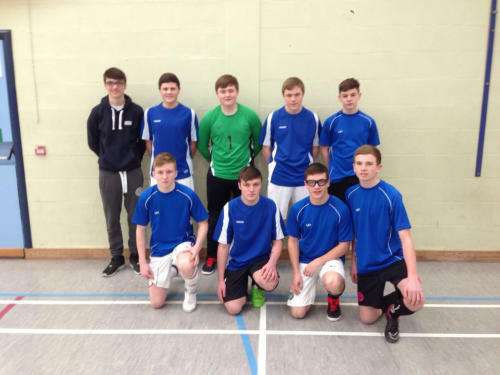 30.01.2016 - Senior football team qualify for the Scottish 5 Aside Final. 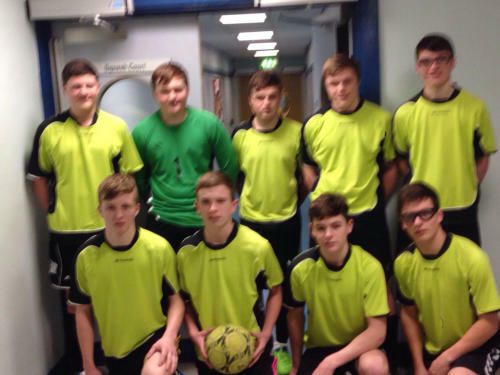 Congratulations to our senior football team who qualified for the scottish final in Dundee on Saturday 30th January 2016. (See photo below). Back row : Brodie Christie,Innes McKay,Ryan Brindle,Jamie Wood, Scott Innes. Front row : Lee Cowie,Greg Hay Ross Coull. And Evan Smith. Copyright © 1st Buckie Boys’ Brigade. All Rights Reserved.